Welcome to backgammon — an age-old game perfectly suited to modern times. It is the oldest game in recorded history and has often been called the aristocrat of popular games. Though only in the last decade has backgammon caught on in the United States, like good wines and incense it has been popular elsewhere for centuries. Essentially a running and blocking contest based on mathematical probabilities, each player simultaneously protects his own men while trying to advance them toward home and offensively attacks his opponent’s men in order to retard their progress. The game is quick, calculating, decisive, and yet unpredictable until the very end. As luck will have it (and the luck of the toss is a definite uncontrollable factor), it is also — at times frustrating and exasperating, exhilarating and rewarding. One board, a pair of dice, thirty men, and a doubling cube — these are the raw material for billions of possibilities. Every contest is a unique combination of skill and chance. There probably never have been two games played exactly the same way in the long, long history of backgammon. Excavated relics and extant literary references indicate the game’s popularity among the ancient aristocracies of Greece, Rome, Persia, and the Far East as far back as Biblical times. 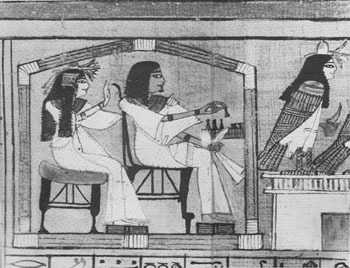 From way back when, backgammon players have been in good, if occasionally notorious, company. Plato mentioned the game and its popularity among Greek high society. Later literary allusions indicate the Roman ruling classes also considered the game extremely fashionable and pleasurable. The emperor Claudius even wrote a book on the subject, perhaps to clarify the nobility of the game, for his predecessor Caligula was known as a cheat. The Romans, however they played, called the game tabula, most likely after the table or board on which it was played. When the Romans invaded Britain, the imported tabula with them. The English anglicized the name of the game to “tables” and kept it as a popular aristocratic pastime throughout the Middle Ages. Elsewhere, various forms of the game entranced the upper classes. 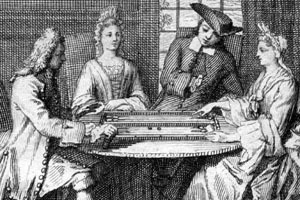 Grand trictrac, probably so-called in imitation of the sound of the rattle of the dice, was très chic in French high society in the seventeenth and eighteenth centuries. 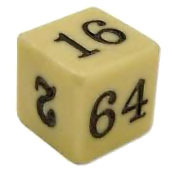 By the early seventeenth century in England, the game was refined into an approximation of today’s game, except for the addition of the doubling cube, which as added in 1925. Edmond Hoyle — who else? 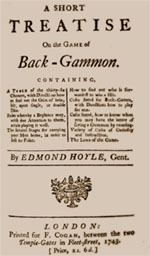 — codified the rules of proper play in a treatise in 1743. And, indeed, references in English history indicate that several kings, dukes, and members of the landed gentry considered backgammon the proper game for English gentlemen. By the mid-nineteenth century, Americans, perhaps in emulation of English manners, began to play backgammon in increasing numbers on their own estates and in exclusive clubs and resorts. About that time, one clever observer of the society around him noted that democracy was too new to have yet been able to organize its pleasures. Local politics aside, certain sports and games in Western civilization had traditionally belonged to the elite. Backgammon, for hundreds of years, was one of those games. After centuries of play within the relatively closed circle of the very leisured class, why now the sudden rush by so man to roll dice and move fifteen stones around a succession of twenty-four points on a board? Frankly, I am surprised it didn’t happen before, since backgammon is the perfect game, one that rewards skill yet contains an element of luck. The outcome of the game is in doubt until the last roll of the dice. Most players readily acknowledge that the doubling rule introduced almost half a century ago — probably by a confident player — sparked up backgammon and turned it into the fast-paced highly charged action game that it is. Addition of this gambling device broadened dimensions and assured more interesting games for players and onlooking bettors. The possibility of raised stakes may served to increase the tension, but it also increases the options. If one player wishes to double the stakes at any point, and the game is obviously to his advantage, his opponent may end the game and pay whatever the stakes are at that juncture. A new, potentially more viable game can then start. If the advantage in the game keeps shifting, the optional doubling, redoubling, and re-redoubling keep the odds jumping and the stakes spiraling. As the cube multiplies up to sixty-four, one well-bet game can — and often has — accounted for a player’s losses or gains for an entire evening. Incredible stories of fortunes won and lost on a single game are a popular part of backgammon banter. But not everyone wants to gamble fortunes. Backgammon attracts its following on several levels. The game is extremely sociable — if players talk a little, eat a little, drink and gamble a little, that is often all part of the ambience — visually rewarding, and almost always fast. The average contest takes five or six minutes. Backgammon is now one of the biggest money games in the world. 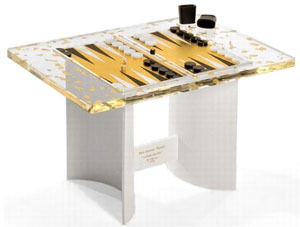 Last year, in the United States alone, over five million dollars’ worth of backgammon layouts were sold. These ranged from brass-legged, specially inlaid marble tables priced at several hundred dollars, to standard wooden models costing under ten dollars a set. Checkers, which ordinarily are packaged by the dozen (so more than one set will be needed), and the back side of many dime-store checkerboards can double as inexpensive setups. The burgeoning popularity of the game is evident in the number of visible tournaments and contests at country clubs, private clubs, resorts, and charity functions, as well as at ski lodges, neighborhood pubs, and in the back rooms of increasing numbers of favorite restaurants and nightclubs. 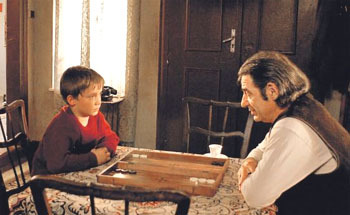 Trend-watchers claim that backgammon may be one of the greatest two-handed family entertainments yet — whether or not played for real stakes. It offers multiple advantages over the standard alternatives for family enjoyment. Chess calls on pure logic and strategy and can be taxing and time-consuming for both the players and any spectators. And checkers is often too predictable — experts playing one another often can tell from the first moves who will be the victor — or too repetitious. Old family favorites like Scrabble and Monopoly are always lengthy affairs and often reflect age and experience to an unrewarding degree. Backgammon contests have been perennial favorites among families, friends, and strangers, rich and otherwise, in the Middle East and the eastern Mediterranean countries. In Greece and Turkey, backgammon is practically a national pastime. Nearly everyone plays, from ship owners to fishermen, from tour guides to cab-drivers, and the cabbies will often take breaks between fares to toss the dice at moultezin and gioul, local Turkish variations of the game, or plakoto or eureika, as the sport is known in Greece. In Europe, game play attracts international celebrities, their entourages, and others nightly to such places as the Traveler’s Club in Paris, the Palace Hotels in St. Moritz and Gstaad, and clubs in other resort cities like Cannes, Monte Carlo, and Lisbon. 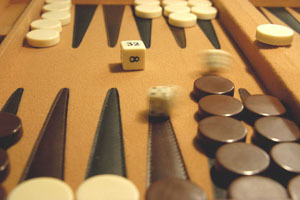 For followers of the backgammon circuit, the game offers glamour, good company, and fulfillment of gambling appetites. Championship stakes at tournaments lure the rich and the talented, some to bet and some to play. In official tournaments, sponsors put up prize money or backers bid for players and split the winnings with them — sometimes both. Although experts at the game are quick to encourage novices by claiming anyone (with luck as a silent partner) can win, it is imperative for new players to understand that in the long run good dice plus good strategy make for the best bets. Playing well consistently means acquiring subtlety and finesse. These come from playing, particularly with opponents at the same or more proficient level, even if the learner loses in the process at the outset. To help the novice backgammon player to understand and develop his or her game, Beginning Backgammon puts it all together — the basic principles of the game, thorough explanation of the strategies and their possibilities, and lots of sound advice. The next move is yours.